You’ve spent hours making a beautiful piece of jewellery but what are your options when it comes to packaging? In this blog post, we share our top tips on choosing the best packaging for your handmade jewellery business. Packaging is such an important part of the customer’s buying journey and it can add that personal touch which will keep them coming back. Packaging adds that professional feel to your business and with so many options out there, it can really make you stand out from the crowd and land you those sales. Perhaps you’ve always struggled to sell your beautiful jewellery at craft fairs? Everyone tells you how amazing your designs are, and that it will sell in minutes. You set up your stand and position the new piece in a good place amongst the other products and sit back and wait for it to be snapped up. The clocks ticking and as the day goes by people are looking and admiring but not buying. The person next to you is selling, selling, selling. Why? what am I missing you think to yourself. When you take a closer look at the stall next to you it’s clear to see. This person has got it all together. A beautiful displayed product with amazing packaging. It’s not even what you wanted but you want to buy it, you’re drawn in. The white box with the embossed logo and pretty bow is the icing on the cake and is helping to sell that item. Don’t settle with your first idea. Have a good look at what’s out there to use and look at shapes, styles and sizes of packaging that competitors are using. What looks successful? Research packaging trends. Create a mood board with photos of packaging you like. Start thinking about the size of the jewellery and what packaging would suit it. Think about materials to use. Once you have created a mood board and really started to think about it, then you can delve deeper. There are many styles of packaging available to buy. Boxes, flat pack boxes, boxes with lids, different shapes, tubes, pillar boxes, kraft card products, paper bags, gift bags, envelopes, organza bags, packaging fillers, ribbons, tags. After doing your initial research you will already have an idea of what you would like and can start to research suppliers online. Today, many people are aware of the impact of plastic and there are lots of alternatives to explore. Packaging that can be recycled and re-used is a great option. Recycled card and paper are readily available to buy, and natural materials can make an elegant organic look. Reduce the use of single use plastics and explore alternatives. If it is essential to use plastic, look into biodegradable and 100% recycled bags. Biodegradable Bio-film and polypropylene clear display bags give a professional finish with card inserts. When thinking about packaging solutions, you also need to think about costs. If your beautiful single box has cost £3 you would need to absorb this in your selling price but it’s going to push the selling price up a lot. Ideally, you want to buy a larger quantity of boxes from a wholesaler to reduce the individual box cost. Never compromise on quality. Poor quality packaging will suggest your product is poor too. Packaging can work out expensive, so you really need to weigh up all of your options to make the best choices. If you sell online you need to think about how you’re going to send that product out. It needs to be protected and reach the customer in one piece. Postal tubes, reinforced boxes, padded envelopes and mailing bags are all options. Also, think about the size of your product's packaging and look online for costs and courier services to suit you. You may decide to have packaging designed by a packaging company to fit your exact requirement. 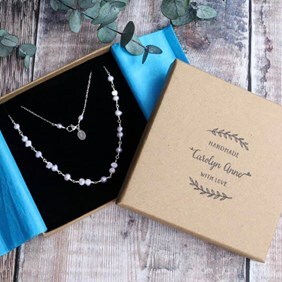 A popular option for jewellers is a custom printed embossed logo on the box. Logo printed tissue paper, paper bags and stickers are all reasonably priced options for bespoke printed packaging. After looking at costs and minimum orders, you may decide to make it yourself. This is a great option for a personalised original look. Research suppliers for card and envelopes and look at tutorials on YouTube advising how to make simple boxes and bags. You may decide to purchase a rubber stamp with your logo on to stamp onto your box, bag or paper. Other options would be to hand paint, stitch or create lino and screen prints. 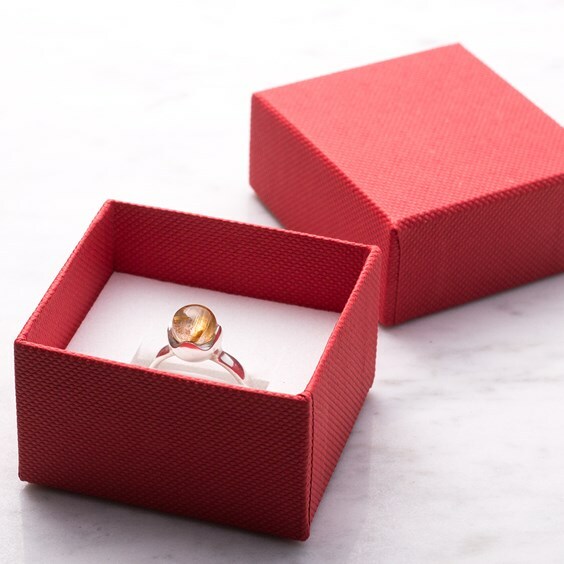 Putting effort into your packaging will make your customer feel special. Little touches such as a personalised handwritten note can make all the difference. Include details of your product. Maybe on a separate card that’s included, printed on the box or on a swing tag that’s attached with a pretty ribbon. Say exactly what you’ve used so the customer knows exactly what they’re buying. Make it personal. If your necklace is inspired by boats in St Ives, add those details. Mention the gorgeous blue chalcedony cabochon inspired by the sea and why you’ve used it. The customer wants to feel like they’ve been involved in the design process. Include your beliefs. If you’re eco or your product is unique, shout it from the rooftops. Tie your packaging in with your brand, colours and beliefs. Make it recognisable to your brand and keep it consistent. Keep it modern and current and think about how long you’ll use the same packaging design for. Avoid wastage with careful planning. 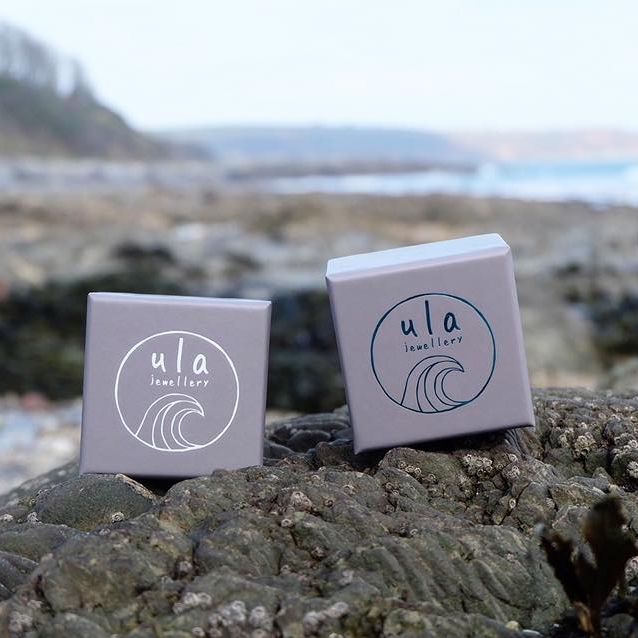 We’ve done a lot of the work for you and have a lovely selection of packaging available to purchase here at Kernowcraft. 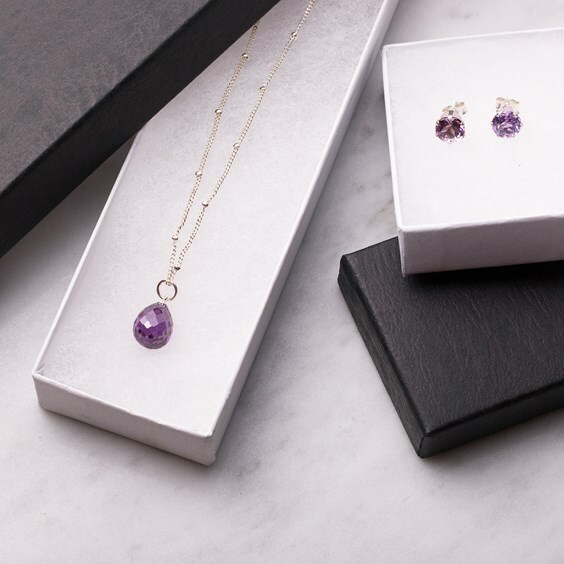 Shop our selection of presentation boxes and gift bags to give your jewellery a professional finish. We love Robyn's packaging which is recycled and eco-friendly - we think the logo really stands out too. 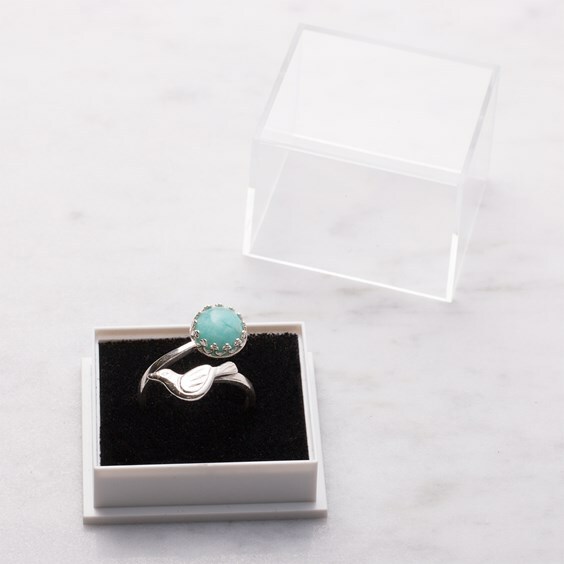 "I want to keep my packaging as environmentally friendly as I can, plus because I use gemstones I wanted to keep everything as natural as possible." 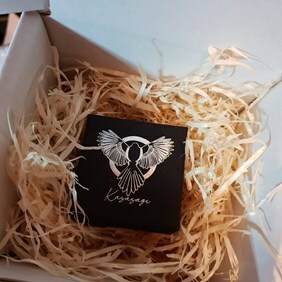 "My packaging is black with velvety sponge inserts to make the jewellery stand out. Finished with an embossed silver version of my logo. When sending my items off to their new home I package them in a cardboard box filled with straw to make it look like a birds nest. Finish with a thank you for your order card and tada! Ready to be received by their new owner." "I have some white bags which I put a tag on using navy ribbon, infused the bag is a polishing cloth and a care postcard. 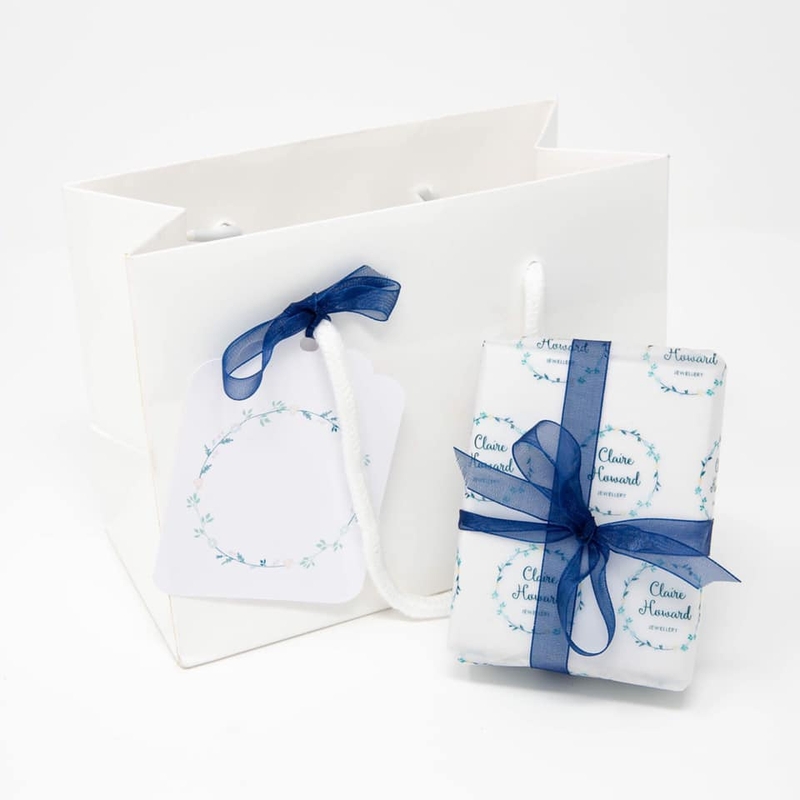 I use white boxes and then wrap them in wrapping paper with my logo on it tied with navy ribbon."